My tryst with Anuja Chauhan’s books began with The Zoya Factor. I was in my second year of graduation and I found this book with a quirky cover at Landmark book store (unfortunately the chain of stores closed down). It is after four years of the discovery that I finally read the book from British Council, Ahmedabad. Before I start digressing way too much, let me cut it short and tell you that I fell in love with her book, her characters, her wit and wisdom and her overall writing style. 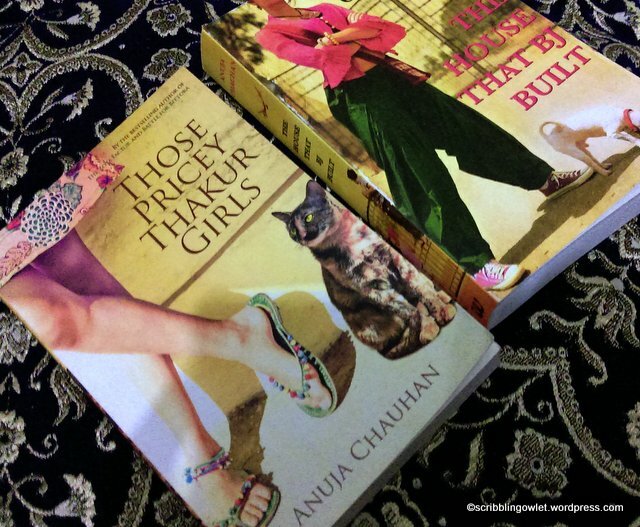 This is what led me to pick her books – Those Pricey Thakur Girls and The House That BJ Built. There is of course, Battle for Bittora, which is currently on my being-read list. While Those Pricey Thakur Girls gave you a good dose of romance brewing up between D for Dabbu and D for Dylan and E for Eshwari and S for Steeeeesh, The House That BJ Built – a sequel, was about Bonu and Samar. Sparkling with brilliance at every page, both the books keep you hooked with twists and turns, laughter and gasps. The Hinglish dialogues make their mark and the characters are well-etched to make you believe in them and their actions. Like every Chauhan novel,every story finds a connect with the audience. There are some loose threads of course, but nothing that can mar your reading experience. I highly recommend the books to anyone who is looking for a light read, which is a meaty, masala romcom. If you haven’t already tried any of her books, get her box set from any of the online stores. This book was sent to me by the publishers as a part of the Goodreads Firstreads program and was my first ever win at a giveaway. To be frank, I was initially hesitant to go through a book with such a shocking title. A racist being amazing? How can a racist be amazing? After shilly-shallying with the idea of reading the book, I finally opened the first page and read it. Each day I read two pages and after ten pages or so, the book had me completely engrossed. The reason? Its amazing humor, the narrative and the characters, with whom you could easily identify and sympathize with. The story based in the lovely locales of Sri Lanka had a charm that kept me interested till the very last page. The humor is of course, the main highlight of The Amazing Racist, but so is the wonderful relationship between two of the main characters, which gives it a fresh perspective. The twists and turns (often hairpin bends) offer more ‘masala’ to the entire story and never lets you witness a dull moment. I have not read a book this good of recent. The book is a page-turner and although it is a light read, it touches your heartstrings somewhere, especially when you inch towards the end. The only disappointment…it is too short a book. I wish there were more pages. Reading The Amazing Racist was a joyride. I am now looking forward to read the next book by the author – Panther. Read more about the book on Goodreads.